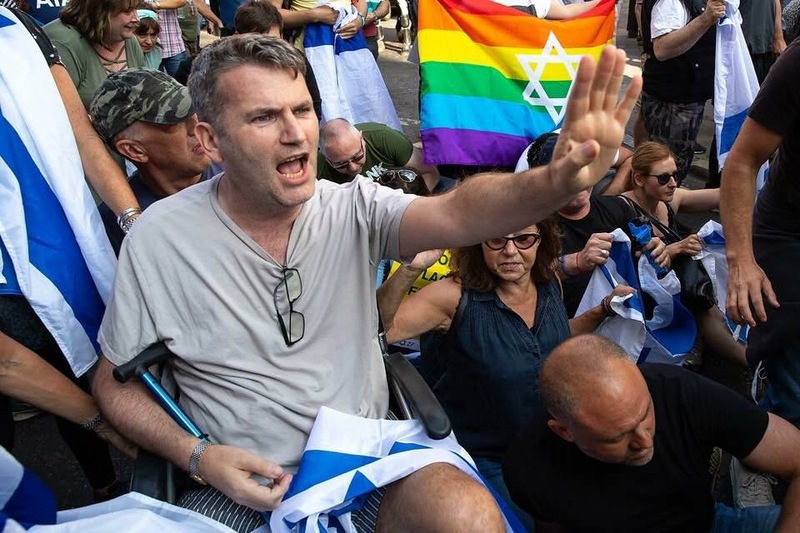 June 11, 2018 — London … A Jewish lawyer, Mark Lewis, who halted a rally for the terror group Al Quds on the streets of London for an hour by refusing to move his wheelchair told the Israel News Agency that he did so to protest against Hezbollah flags and “inflammatory rhetoric”. “I wasn’t alone,” said Lewis. Thousands of pro Islamic terrorism demonstrators gathered outside the Saudi Arabian embassy in central London on Sunday, where they flew flags of Lebanese Islamist terror group Hezbollah. 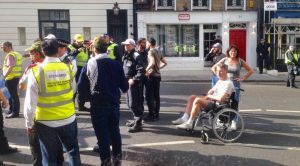 Their march towards Downing Street was due to begin at 5 pm but demonstrators were unable to progress after Mark Lewis, who suffers from multiple sclerosis (MS), refused to move. The lawyer attended the counter-demonstration with a contingent from the UK branch of the Herut political party, a right-wing Zionist party founded by Menachem Begin. “The problem is the government and the Home Secretary for allowing terrorists on our streets. I take exception with the Hezbollah flags and the inflammatory speeches calling for the destruction of a country,” said Lewis. Lewis is a very well known, respected lawyer in the UK. He started the “phonehacking” cases against Newscorp and represented the Dowler family in the case that closed the News of the World, the biggest selling newspaper in Europe. On a Jewish level he was a director of the UKLawyers For Israel conducting much “Lawfare”. Lewis, who is 53, has had MS for 30 years. Last year he was on a medical trial at Hadassah Ein Kerem Hospital in Jerusalem and the subject in a documentary on channel 4 UK might that could be found on a YouTube search for a miracle cure. Lewis is known for breakthrough law suits and standing up to bullies. According to a PBS documentary he says: “I don’t have the fear gene”. I have been profiled in the New York Times and Wall Street Journal as well as many other papers from several countries. Lewis advises several Jewish organisations and newspapers. And does so often behind the scenes. As a teen he was active in BBYO (AZA) was a guide on two Israel tours and a counsellor at New Jersey Y Camps. “There is no obvious reason why the UK government hasn’t proscribed Hezbollah, says Lewis. “I describe myself as an “unapologetic Zionist”. I do not fetter myself with the organisations that spend time trying not to upset people,” says Lewis. “Amazingly, a little knowledge of criminal law and the rights of protesters baffled officer after officer who challenged me. Lewis says: “As a community we know that HM’s Opposition is a problem but HM’s Government is not much better. It was the Government that allowed this march to take place. Seriously, the Police enforcing the will of the Home Secretary saw a wheelchair as a greater threat than a machine gun. Before she was Prime Minister, Theresa May as Home Secretary said that the Al Quds march should be banned. She seems not to have passed the message on to her successors. The stand off was not planned. I had moved to the route where the marchers had planned to go thinking that a large number of people would do the job that the Government should have but the Police following orders from on high moved us all away. Mandy and I refused to go. A civilian support worker told me that I had to move. My lawyer’s mind kicked in, and I asked why? He walked away. Two officers came and told me that the marchers would walk around me and they “could not guarantee my safety”. “That’s ok” I said, “I never asked you to, I’ll take the risk”. They walked away. Two more took over and said they would stand by my side. Another officer then told me that I had to move and that the Police had an order closing the street. I asked: “Can I see it?” He shrugged and walked away mumbling that it was in a van somewhere. After 45 minutes, a different officer told me that she would arrest us. I pointed out that the Police had said we could stay and so we were doing nothing wrong. She then went away and then came back to withdraw my permission at which point she warned me that we would be arrested. The Police had chosen the side of the terrorists.